When you are craving a good, beefy taco, these slow cooker barbacoa tacos will satisfy this perfectly. Beef roast is slowly cooked in a homemade guajillo chile pepper sauce until it is fall apart and shredded, served simply in soft tortillas with red onion and cilantro. 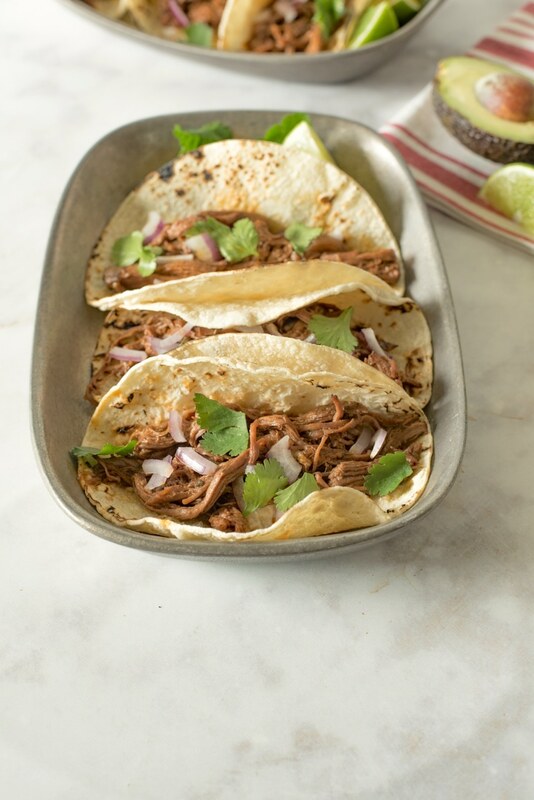 Barbacoa tacos are a traditional Mexican dish where the beef is prepared over a grill. 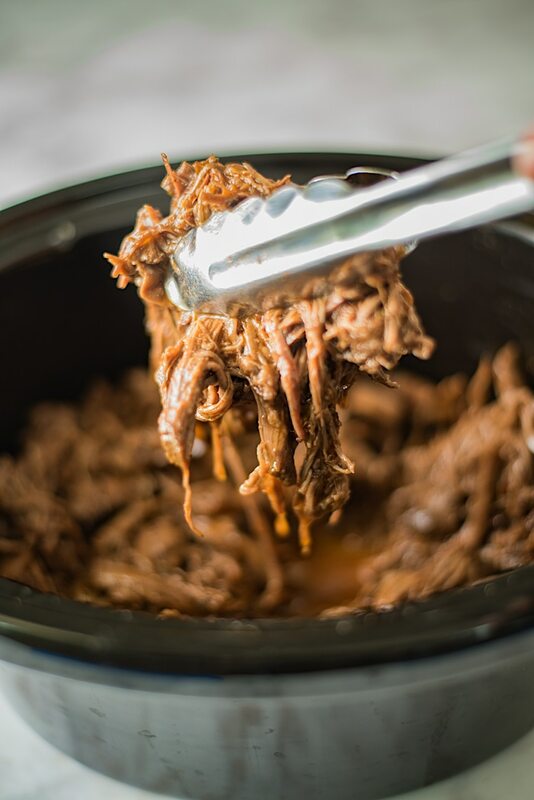 Traditionally, it was an underground pit, but if like me you don’t have an underground pit available to you and since it is winter not much grilling is going on, a modern-day slow cooker works just as well. For a step-by-step video to see the recipe being made, just press play! Barbacoa tacos are a traditional Mexican meal. 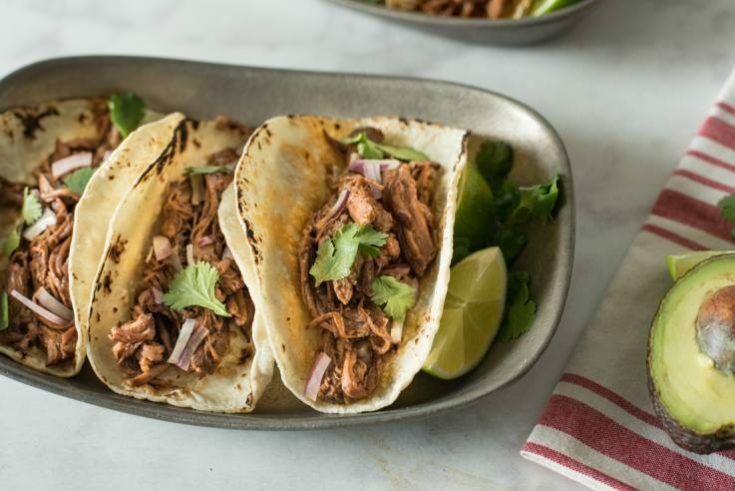 The meat is slow cooked in a dried guajillo pepper sauce that is similar to the sauce in these slow cooker pineapple pepper carnitas tacos. Dried guajillo chile peppers are a mild to medium pepper, so they don’t bring too much heat to the sauce. The peppers are toasted in a dry pan to bring out extra flavor and then added to boiling water along with all the aromatics for the sauce like garlic, cilantro and fresh tomato and sweetened with agave. They are simmered for a little to soften and then blended to complete the braising sauce. Since the beef is slow cooked for many hours a chuck roast works very well as this cut of meat needs a lot of cooking to help break it down and make it tender. 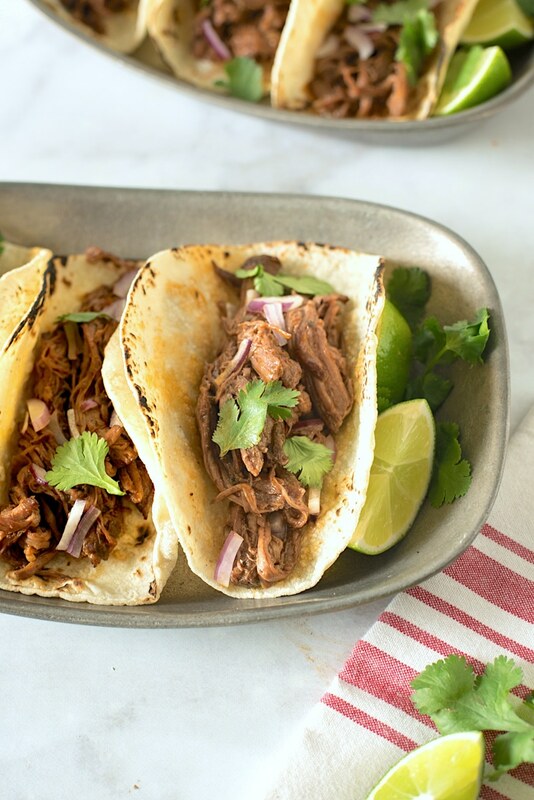 These slow cooker barbacoa tacos make a great weeknight dinner. You can make the sauce the night before then throw everything into the slow cooker before leaving for work the next day. These tacos also make great leftovers. The toppings are traditionally simple of red onion and fresh cilantro. Anything you like can be added to the tacos, I like adding avocado and a good salsa but the possibilities are endless and taco toppings are a very personal choice. Beef roast is slowly cooked in a homemade guajillo chile pepper sauce until it is fall apart and shredded, served simply in soft tortillas with red onion and cilantro. Add 2 cups water to a saucepan and bring to a boil. While the water is heating, add the chiles to a non-stick pan over medium heat. Press the chiles into the pan so they toast, turning often, don’t burn. Transfer the peppers to the boiling water and add the garlic, cilantro, tomato, agave and salt. Turn down to a simmer for 1 minute. Turn off the heat and steep for 15 minutes to soften the peppers. When the peppers have softened, transfer to a food processor or blender and blend until smooth. Strain the sauce into the slow cooker. Discard the paste from the strainer. Turn the slow cooker on low. Season the beef with the salt, oregano and cumin, rub the seasoning all over the meat. Add the beef to the slow cooker and spoon a little of the sauce over the meat. Cover and cook for 8 hours on low or 4 hours on high. Use 2 forks to shred to the beef, mixing into the liquid to moisten and flavor the meat, add more liquid if required. Taste the meat and add more salt if needed, mix well. Serve in corn tortillas and top with chopped red onion, cilantro and any other toppings you like. *Don't worry if you can't remove all the seeds. They will be removed when the sauce is blended and strained. Love the photos! Great work. I need this in my life!! These looks delicious! Whenever my son asks for a snack, I serve Barbacoa Tacos. He also likes it so much. I prefer excess amount of tomato slices to make it further healthy.